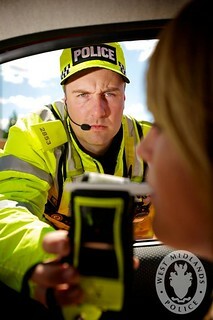 This photo shows one of our Traffic Officers breathalysing a driver as part of a drink driving crackdown. Sadly, figures released today show the proportion of drivers in the West Midlands who risked their lives – and the lives of others – by getting behind the wheel whilst over the drink-drive limit, increased during the first month of this summer, for the second year running. In the West Midlands there was an increase of 18.7% in the number of drivers who tested positive or failed the breath test procedure during this year’s summer drink and drug driving campaign by the Association of Chief Police Officers (ACPO). A total of 1,746 people were stopped and breath tested during the month long campaign in June. 253 of those 1,746 drivers (14.5%) had results which made them liable to arrest, compared to 213 of 1,704 drivers (12.5%) during the same period last year – an increase of 18.7%. The number of under-25s who tested positive remained roughly stable, with a small decrease of positive breath tests from 16% to 15%. In contrast, the number of over-25s who tested positive, refused to provide or failed the test increased by 44%, from 140 last year to 202 this June. Officers arrested 24 drivers on suspicion of being unfit to drive through drink or drugs.